Consider all the K-3 field trip options…museum discovery, MasterMinds and IMAX Educational Movies or a combination of museum and IMAX! Embark on a learning adventure. Imagine, invent and experiment in our hands-on, minds-on exhibits that align with NC Standards. Ready, set, PLAY! Students take on the role of citizens as they become firefighters, journalists, farmers, paramedics and teachers. They cooperate and problem-solve to provide services and explore how people work and live together. Dive into the physical properties of water and solids! Students test what sinks or floats at the water tables, conduct experiments on the USS Science Sub and set sail for adventure on the pirate ship. Investigate what makes a garden grow and help care for plants. Students work together to identify roots, leaves, flowers and seeds that make up healthy food choices. Presented by Blue Cross and Blue Shield of North Carolina. From seed to sprout to garden oasis! Students pretend to plant fruits, vegetables and colorful flowers and mulch, and water and care for their greenhouse treasures. Traveling between the first and second floors of the museum? Take the stairs! Students will love our playful piano stairs with authentic keynotes and colorful lights. Students explore how people earn and use money for goods and services in the pizzeria and pet shop. Money flows through the bank as students aim to save and make deposits and withdrawals. In partnership with your North Carolina banks. Create, innovate, design and construct! Students experiment with how objects move as they build cars, use a variety of scrap materials to design inventions and build super structures with giant Legos. Students put their skeletal and muscular systems to the test! Shoot, skate, climb, dribble and balance. Pretending to cook from the My Plate table reinforces healthy nutrition. Presented by Carolina Hurricanes. Using cranks, levers and pulleys, students work together to keep the electricity flowing through the power grid. Students learn about where energy comes from and how to use it wisely. Presented by ABB. 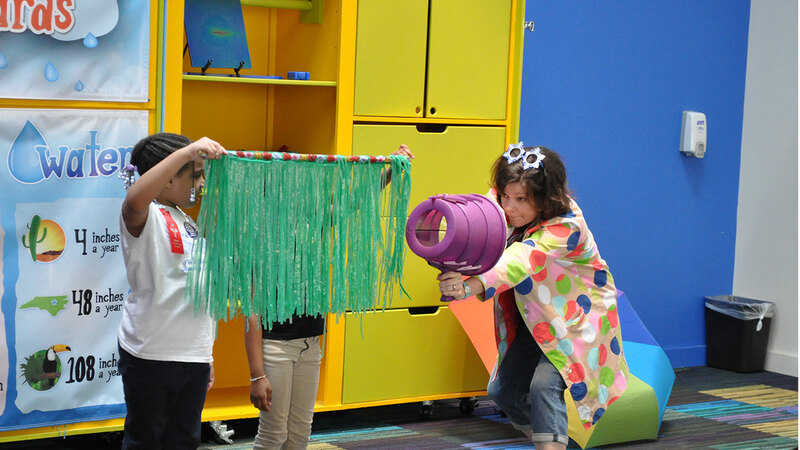 Charge up hands-on play at challenge stations about science, technology, engineering and math! Students make and test fliers that soar up wind towers, build and re-build circuits and engineer solutions to brain teasers. New stations coming Fall 2018! Presented by Duke Energy. Artists at work! Imagination and self-expression unfold as students use high-quality materials to create artistic masterpieces. It's all about the process. Delve deeper into biology, money, meteorology or world cultures with a 20-minute Museum MasterMind, an interactive presentation that builds on grade-level content aligned with NC Standards. The human body is built to move. Explore how bones, muscles, heart, lungs and brain all work together. Learn how being active and eating smart fuels healthy play. Sponsored by Chiesi. Join the celebration and explore the music, food, customs and traditions that define cultures around the world. Making smart money choices isn't magic, it's dollars and sense. Students learn how to earn, save and spend responsibly. Meteorologists in the making whip up a storm and experiment with the key ingredients of weather­-air, temperature and moisture. Get the most out of Marbles and take learning to the third dimension with an IMAX Educational Movie. Your students will literally reach out and try to touch images jumping off NC's biggest screen. Movies are approximately 40 minutes and align with NC Standards. Explore the incredible story of two endangered species - orangutans and elephants - and the trailblazing heroes saving them from extinction in Kenya and Borneo. Investigate the longest insect migration on Earth, and soar alongside half a billion butterflies heading south on a perilous 3,000 mile journey across North America. Watch butterflies unite countries and cultures and turn scientists into detectives uncovering the amazing journey of these tiny creatures. Narrated by Gordon Pinsent. Journey alongside scientists working to protect the giant panda species, and meet Qian Qian, a baby panda born in captivity and destined for life in the wild. Discover the world's most exotic undersea locations, and experience face-to-face encounters with mysterious and stunning creatures of the ocean. Learn about the ocean ecosystem and how we can preserve it.